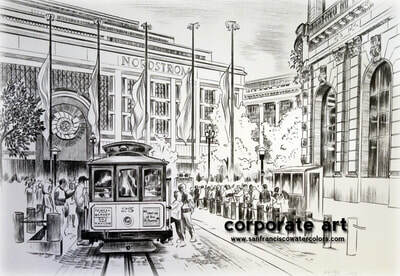 Corporate Artwork - San Francisco Watercolor, Fisherman's Wharf nicely displayed in the office of a dentist. 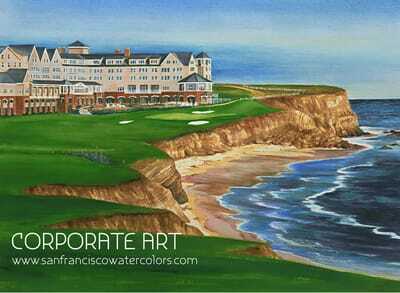 Special thanks to Burlingame Realtor, Raziel Unger for including my artwork in his calendar. 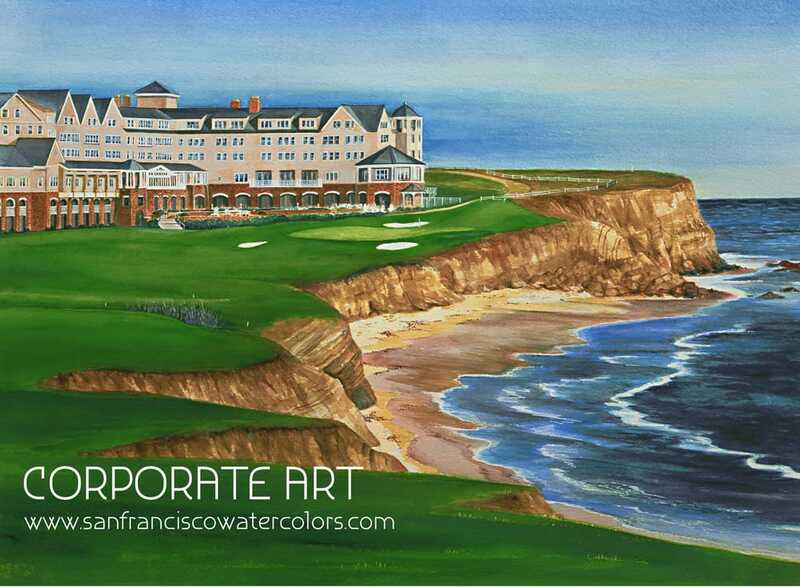 ​Eskaton a Non-Profit organization beautifying hospitals and retirement facilities throughout the nation, recently included 130 paintings in their new 6-floor facility in Burlingame. Two are paintings by Dale Perkins, ‘The Burlingame Train Station’ and ‘Burlingame Avenue’, (commissioned by Raziel Ungar). Dale is grateful for being included in the selection. 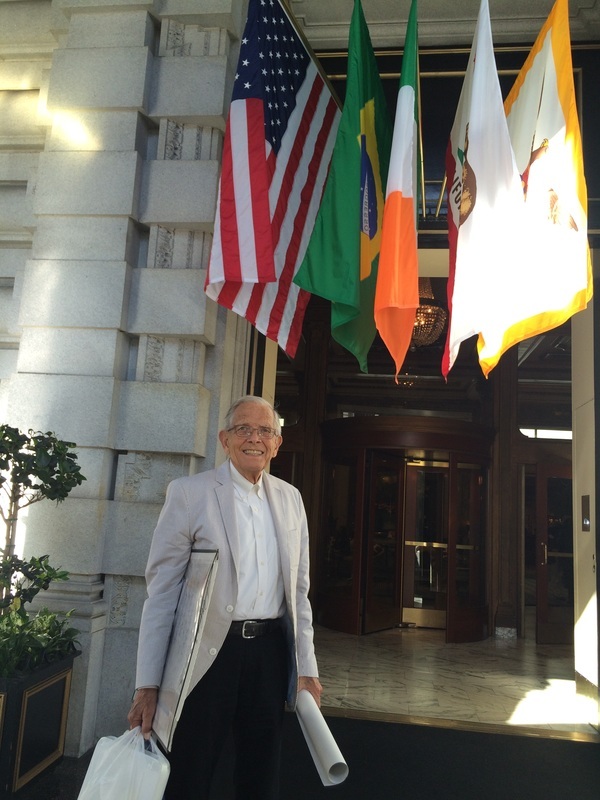 Dale Perkins provides watercolor art for the Burlingame Beautification Commission as a gift to those companies in Burlingame that pay special attention to their environmental surrounding. Here are some of the winners. Filoli enjoys hundreds of thousands of worldwide visitors. Ray McKenzie Sales head of The Clock Tower Shop similarly uses the world for his Shopping Cart. I thank Ray McKenzie and Donna Colson, Burlingame Vice Mayor and Past President of Filoli were instrumental in including my art in the Shop, Dennis Mayer of Burlingame provided Filoli with high resolutions of the four flowers. My donation allows Filoli full rites to use the flowers as desired. Watercolors by Dale Perkins now available at Filoli at the Clock Tower Shop. Enjoy! San Francisco Firemen, proud owners of limited edition print of FireBoat in San Francisco, California. 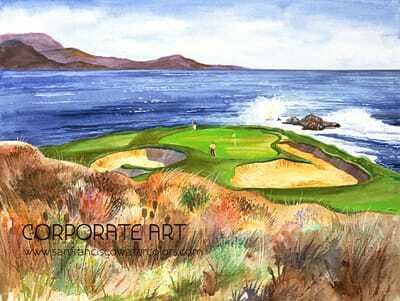 Corporate Watercolor Artist Dale Perkins discusses Corporate Art! 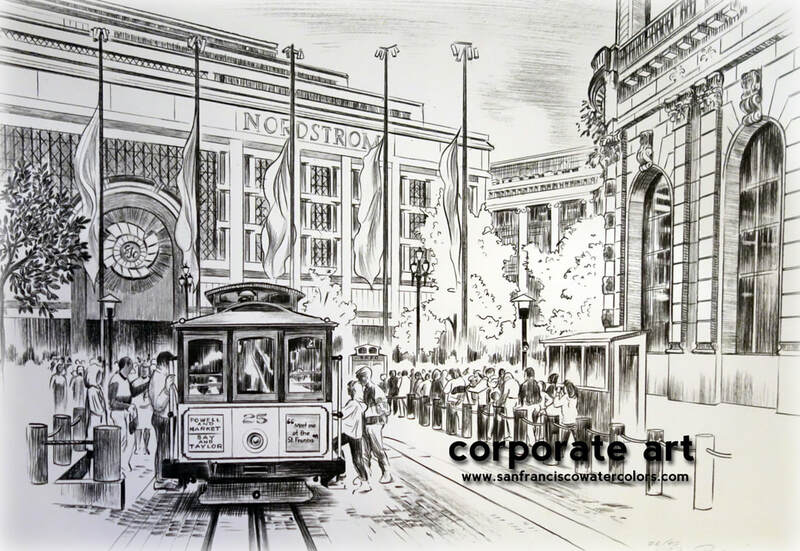 San Francisco Watercolors have several great options for Corporate Art. We have programs that are the perfect reward for your sales team, top performers, executives - with gifts that go beyond the traditional wine and cheese baskets and memories that last until the gift basket food is eaten. 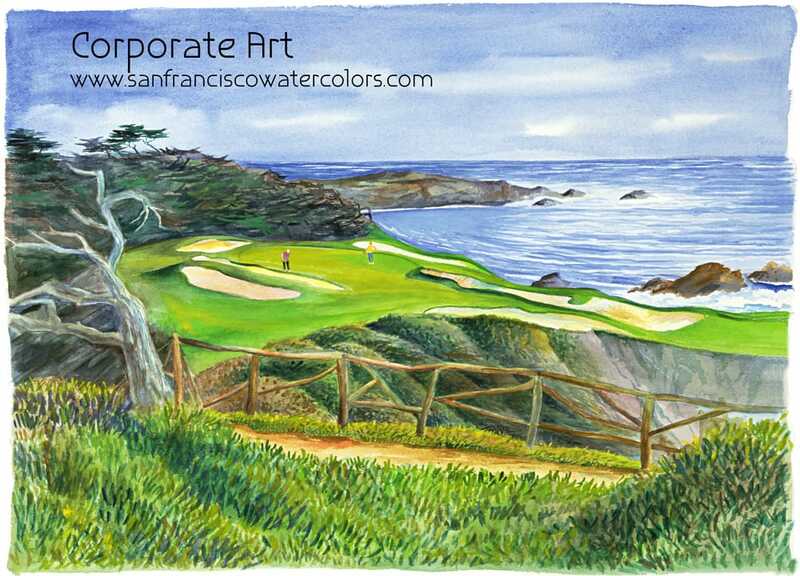 With artwork by San Francisco Watercolors, you can give your employees, partners, board members - anyone .... gifts and memories that will last a lifetime. 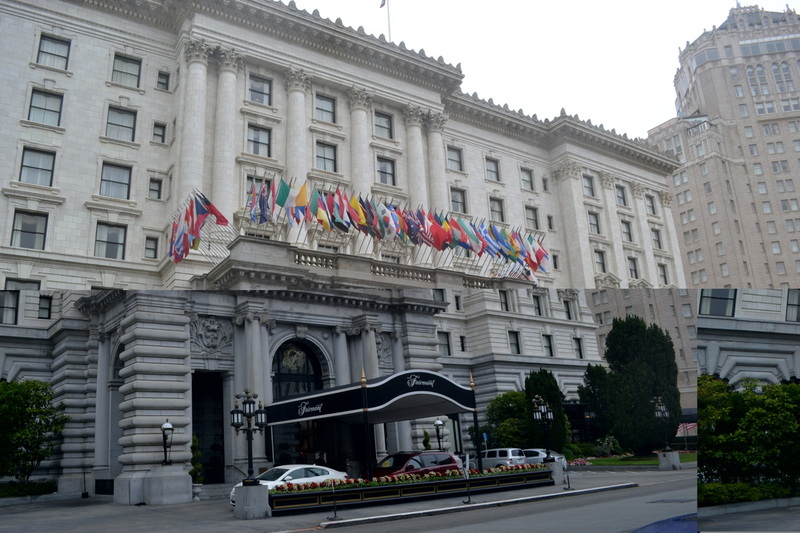 A Corporate event that took place at the ﻿Fairmont Hotel in San Francisco﻿. 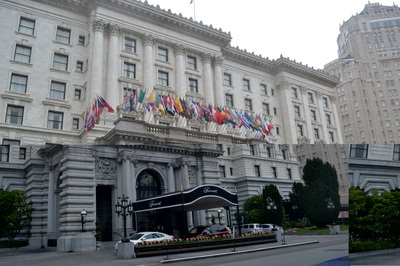 The event was a celebration of the top sales performers and was attended by top executives who spoke on the great year that the company had had, the future of the company and to say thank you and "job well done" to the top sales performers and their significant others for their amazing contribution to the success of the company. 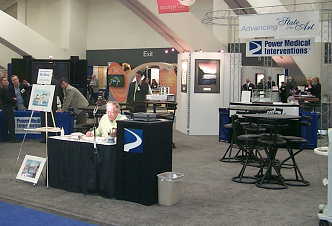 To view a Case Study on this event, click on this link (Corporate Case Studies). 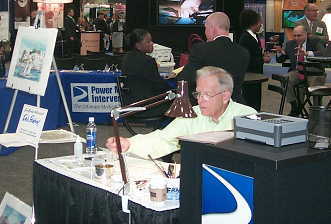 Leave a lasting memory for Corporate Clients! Here is an example of a pen and ink rendering of a winery in the California Napa Valley that was commissioned by a Fortune 500 Company by San Francisco Watercolors, whose executives were visiting the Wine Country from out of State. Their Top Executive received the signed, original pen and ink rendering and the other executives each received limited edition Giclee prints along with Wine Country note cards to commemorate their very special event. Every print came with a Profile of the Artist, Dale Perkins and a Certificate of Authenticity for the Original and for the Prints. 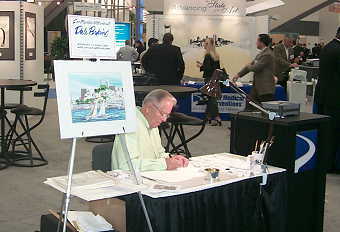 Here is an example of where San Francisco Watercolor Artist Dale Perkins in real time at Moscone Center finished an original watercolor painting of San Francisco that was presented at an Awards Ceremony. Dale answered questions about how he paints, what inspires him and also discussed a bit of history of San Francisco. Make your canvas watercolor print as big as you'd like - perfect for large wall space! The beauty of watercolor canvas is the flexibility that it provides. Unlike watercolor paper, you can hang the finished watercolor canvas painting directly on the wall, without having to frame it under glass. 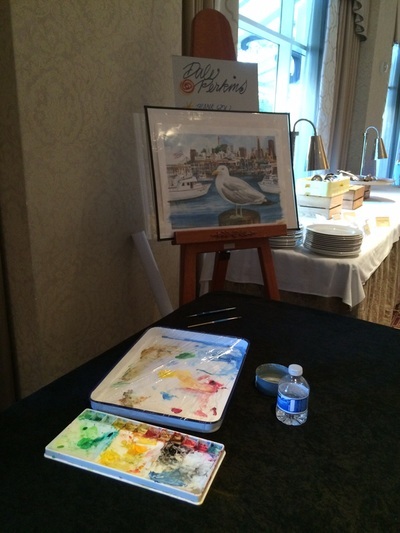 You'll experience the beauty and integrity of the watercolor by the feel of an oil on canvas. It's perfect for large walls or for areas where you really want to make an impact. I can take any of my San Francisco Watercolor paintings and print them on canvas - you'll love the results! Contact us!!! - San Francisco Watercolors - Corporate Art can provide the BEST Corporate Art Solutions for you.